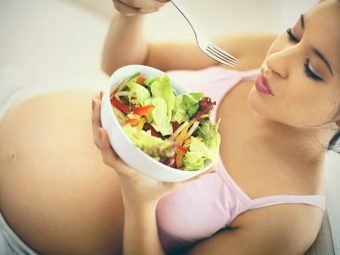 Is It Safe To Eat Radish During Pregnancy? Is Radish Good During Pregnancy? Are you expecting and planning to treat yourself and your baby to some healthy soups and salads? Are you aware that most raw vegetables including radish can spell danger for the little one in your womb? Radishes are a must-have during pregnancy for its nutritional value. However, it can pose a few health hazards too. 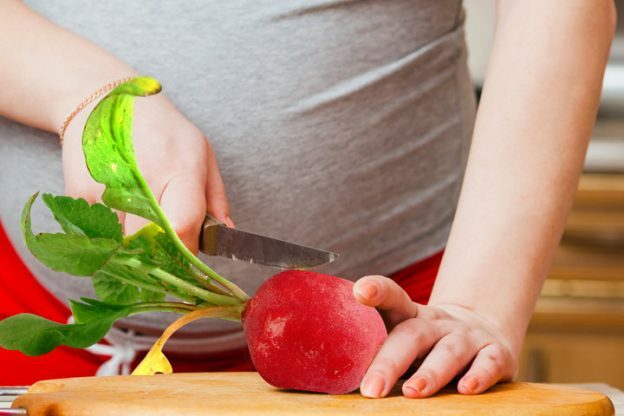 Read on to know whether it is safe to eating radish during pregnancy or not. Also, find a few handy tips to munch on one safely. Just a single serving of radishes a day can provide your body many important nutrients your developing baby needs. Radish is a rich source of calcium. Calcium is an important nutrient you need to have during pregnancy as it aids the development of the baby’s bones and muscles. Radishes are a storehouse of folic acid, which is a vital nutrient for pregnant women. Adequate folic acid levels in the body protect your baby against any birth defects. (1) In addition to that, radishes also contain potassium, iron and vitamin C, which can be extremely beneficial for an expecting mom. You may be surprised to note that radishes, which are a super-food, are not safe for consumption during pregnancy. Pregnancy is a critical time when your baby’s growth and development is at stake. According to the Colorado State University, a woman is prone to illnesses during pregnancy as her immunity is low. Foods grown in contaminated soil are likely to contain toxoplasmosis. The germs may pass from the raw vegetables into the body and cause various infections. The consumption of raw vegetables that are unwashed may lead to a higher risk of salmonella and E.coli infections. (2) Fever and dehydration the classic symptoms associated with these infections may adversely affect your baby’s health. In rare cases, a severe infection may lead to a miscarriage, fetal death, and preterm delivery. 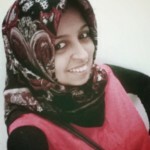 Therefore, remember any laxity in diet on your part may lead to complications in your pregnancy. You can only munch on radishes if you follow a few safety measures while consuming it. The threat of infections does not necessarily imply that you ban radishes from your kitchen during your pregnancy. You just need to follow a few safety precautions while eating radishes and other raw vegetables so that you can keep the threat of infections at bay. Here is a list of safety measures you can take before you snack on radish salad. Make sure you wash the vegetables properly and scrub off any visible dirt. Never consume raw vegetables without washing them thoroughly. If you must, make use of a vegetable brush to get rid of all the traces of dirt and grime on the vegetable. Add radishes to your soups or sauté them to make a healthy side dish. If you have chopped radishes on a chopping board, make sure you clean it again before proceeding to chop other vegetables. Follow these simple steps to safely add radishes to your diet and enjoy its nutritional benefits. You may also consult your doctor before grabbing one. Remember a few hygiene practices go a long way in preventing infections. So, why wait? Go ahead and try some healthy radish salad recipes. If you loved munching on a juicy and crunchy radish in pregnancy, please share your advice and experience here. Is It Safe To Eat Cucumber During Pregnancy? 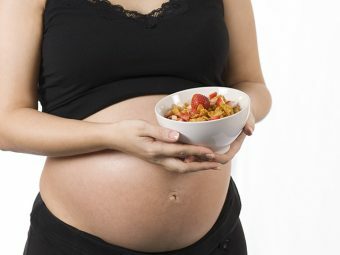 Is It Safe To Eat Potato During Pregnancy? Is It Safe To Eat Sweet Corn During Pregnancy? 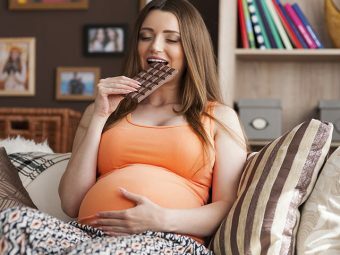 Eating Chocolate During Pregnancy: Is It Safe And How Much To Eat? 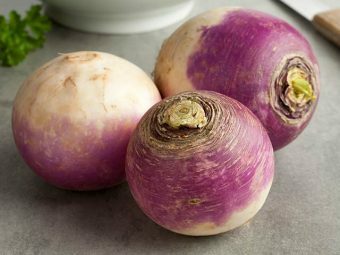 Is It Safe To Eat Turnip During Pregnancy? 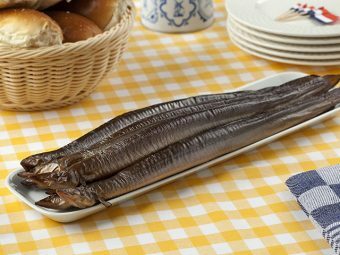 Is It Safe To Eat Eel During Pregnancy?